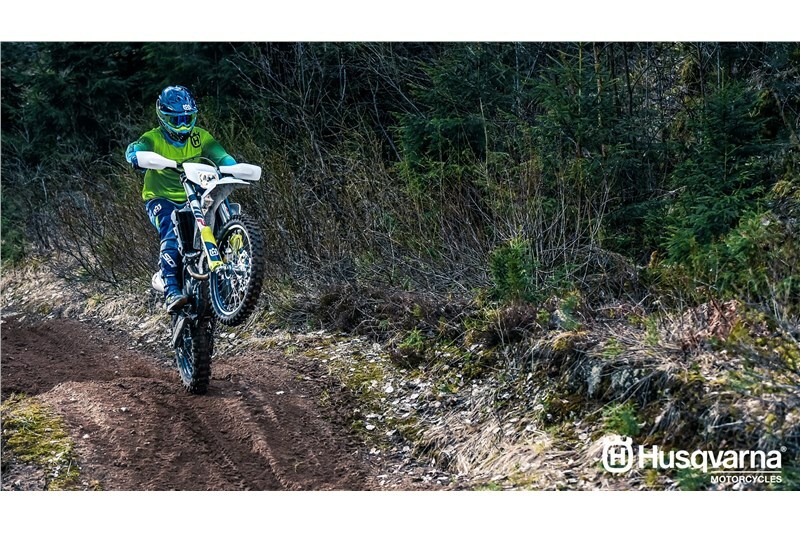 ENGINE Delivering the highest level of performance in the Husqvarna enduro line-up, the 510.4cc power plant is more advanced than ever while weighing only 66 lbs. CYLINDER HEAD The compact SOHC cylinder head is designed to offer the maximum performance at the minimum possible weight. The camshaft actuates four lightweight valves (titanium intake Ø=40mm 32.6g, steel exhaust Ø=33mm 42.6g) through a very robust rocker arm system. CRANKCASE The crankcases are designed to house the shaft arrangements and internals of the engine in the best possible position, centralising masses for a lightweight handling feel. High-pressure die cast production processes results in a thin but reliable wall thickness and keeping weight to a minimum. CRANKSHAFT A plain big end bearing comprising of two force-fitted bearing shells ensure maximum reliability and durability, guaranteeing long service intervals of 135 hours. 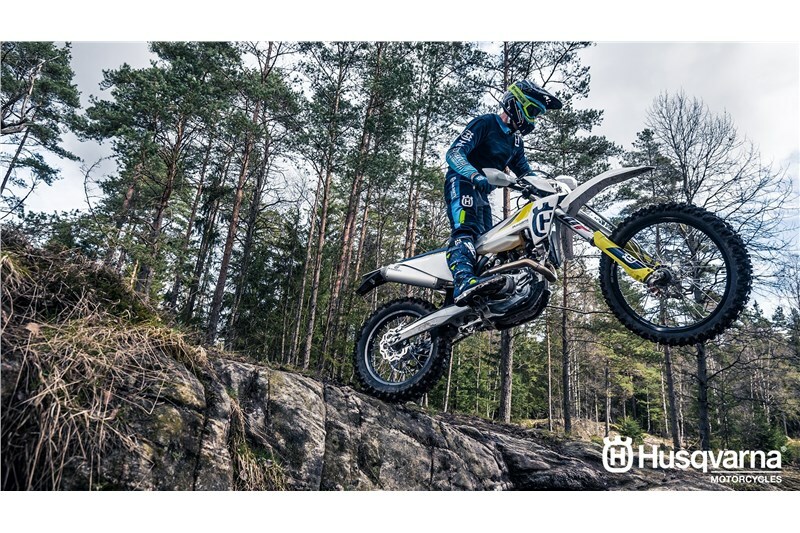 CNC MACHINED TRIPLE CLAMPS The 22 mm offset black-anodized CNC machined triple clamps offer premium quality and style standard on all Husqvarna enduro models. The triple clamps have been expertly crafted using superior techniques and materials to provide high levels of quality and reliability. A 2-way handlebar adjustment is standard and allows for customisable ergonomics. MAGURA HYDRAULIC CLUTCH The high quality German-made clutch system guarantees perfect modulation of the clutch in every condition. This means that the play is constantly compensated so that the pressure point and the function of the clutch remain identical in cold or hot conditions and over time. The Magura clutch also features even wear characteristics and is nearly maintenance-free. ELECTRIC START A standard electric starter guarantees easy starting in all situations. 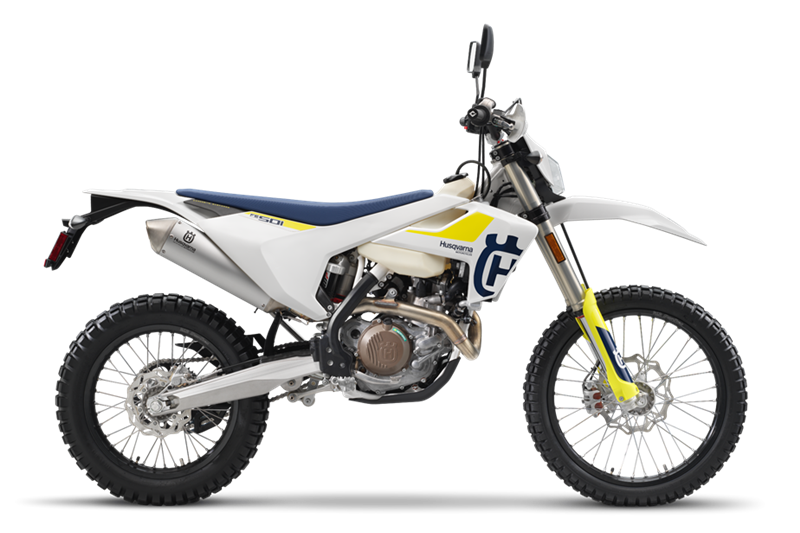 The system is powered by a lightweight and powerful Li-Ion battery which is 1 kg lighter than conventional lead battery.